As you probably know, October is breast cancer awareness (BCA) month. 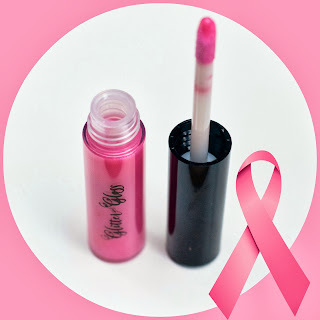 You probably can't go to any store without seeing pink ribbons on every product, but unfortunately many of those products do nothing to support BCA organizations at all. I'm proud to let you all know that this month, in lieu of a discounted "lippy of the month" I will be donating 100% of the proceeds of Lulu - our pinkest pink - to Bright Pink. They are an awesome organization that focuses on the prevention and early detection of breast and ovarian cancer in young women, while providing support for high-risk individuals. KIND is joining radiation oncologist, Dr. Elizabeth Thompson to create a first-ever limited-edition Breast BFFLBag®, which includes Dr. Thompson’s doctor-curated BFFLBag® recovery products. The bag directly provides comfort and care to women recovering from breast cancer surgery (rather than being an arbitrary item colored pink). For every bag sold in October, KIND will donate an extra $5 to Friends Fighting Breast Cancer. People can purchase the bag for a woman in their life who is recovering from breast cancer or purchase one to donate to an anonymous, deserving patient. Bobbi Brown will donate $10 (of the $45 purchase price) of their limited edition "French Pink" blush and brush to the Breast Cancer Research Foundation. Donate $5 to The Breast Cancer Research Foundation, and Ulta will give you one of these adorable bracelets (four different options!) In store, and online. I know this list just barely scratches the surface of the many wonderful companies donating to various Breast Cancer Awareness companies. If you know of any other ones, please link it up in the comments! And be mindful when shopping - that little pink ribbon slapped on a water bottle is just to make a bit of extra cash, unless the merchandise states where they are donating to! ohhhhhh now I want that lipgloss even more! While I love all the products who donate to this important cause, I like to also remind people to beware of "pinkwashing." Sadly, many companies sell items packaged in pink for the month, but the products contain the very carcinogens that contribute to cancer. Be aware of what is in your products! Yep, I second what Bekah said although it is such a great cause people should still be aware!